Move away from the border. The type of violence you see on the news is limited primarily to the border communities, but somehow people have come to think of the goings-on at the border with the whole of Mexico – and that’s just wrong. It’s as wrong as Mexicans seeing reports of border violence and thinking that’s how life is across America. And that’s the point of this post; we should look past the border, and experience all that Mexico has to offer. I spent almost a week and a half in Sinaloa recently. Part of the trip there was spent near Lake Mateos, at Billy Chapman’s Angler’s Inn ( http://www.anglersinn.com/ ), and part at his El Salto lodge. Amazing hospitality and service, and the facilities equaled the service. 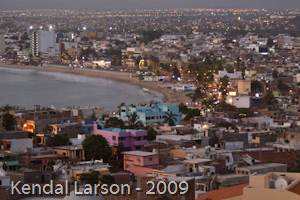 After time in the heart of Mexico we moved to the coast, to Mazatlan. Again – amazing what we experienced while there; the setting and the lodging were extraordinary by any standard. So – there are some great deals going to Mexico right now – and some great deals on food and lodging too. Why not give Mexico another look? I think you’ll be pleased if you do. This entry was posted on Wednesday, August 4th, 2010 at 1:17 pm. It is filed under General. You can follow any responses to this entry through the RSS 2.0 feed.